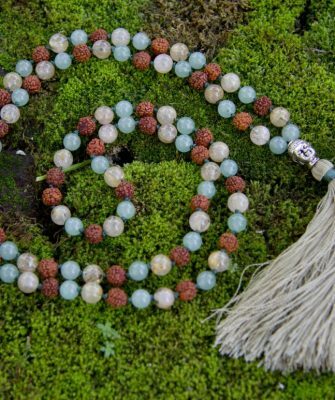 The Centering Mala has 108 prayer beads of beautiful Yellow Jade, Tiger Eye and Rudraksha. This Japamala will guide you by creating a strong sense of self, setting personal boundaries and building self esteem and willpower. Both Yellow Jade and Tiger Eye specifically work with your centre, the solar plexus chakra, and its ability to bring change into your life and to the world is born within this Chakra. Sacred Rudraksha seeds have always been worn for good health, awakening the Kundalini and help increase self power and self love. 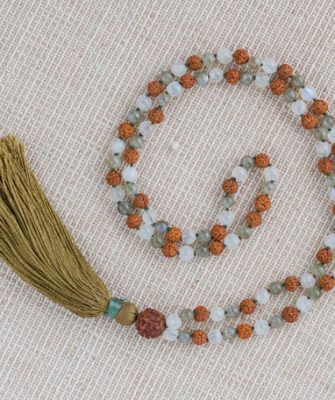 The Centering Mala has 108 prayer beads of beautiful Yellow Jade, Tiger Eye and Rudraksha seeds. 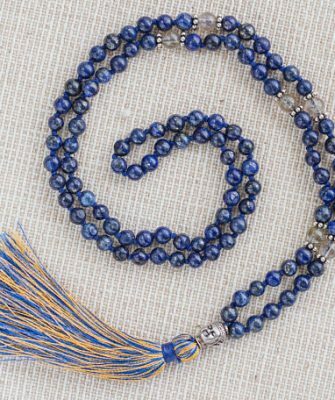 A handmade cream silk tassle is attached to the large main silver bead known as the Guru bead. 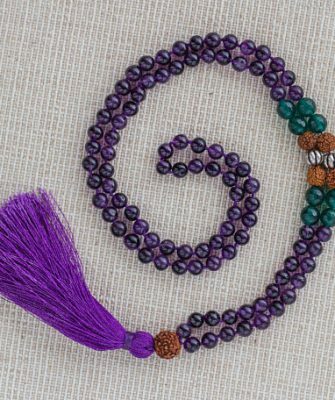 Starting from the Guru bead, 4 groups of silver spacers, each enclosing 2 tiger eyes and a Rudraksha seed, are inserted after the 10th and 20th Jade stone on both sides of the Mala. 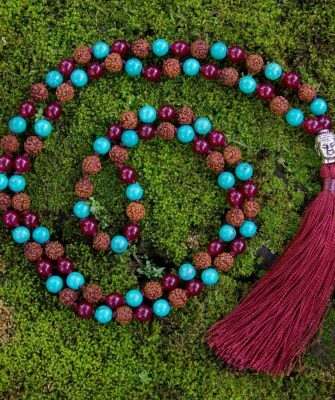 The total length of the Mala including the tassle is 47 cm (18 and a half inches) and excluding the tassle the length is 39.5 cm (15 and a quarter inches). The stones and silver all come from trusted high quality sources in India and Bali and they are a true representation of nature’s intent; none are artificial. We believe Mother Nature graces us with incredible beauty and we have much respect, love and gratitude for her. This Japamala will guide you by creating a strong sense of self, setting personal boundaries and building self esteem and willpower. Both Yellow Jade and Tiger Eye specifically work with your centre, the solar plexus chakra; the ability to bring change into your life and to the world is born within this Chakra. Jade is an amulet of good luck and friendship, dispels the negative and us to see ourselves as we really are. Yellow Jade in particular is energetic and stimulating, yet mellow; it will teach you the interconnectedness of all beings. 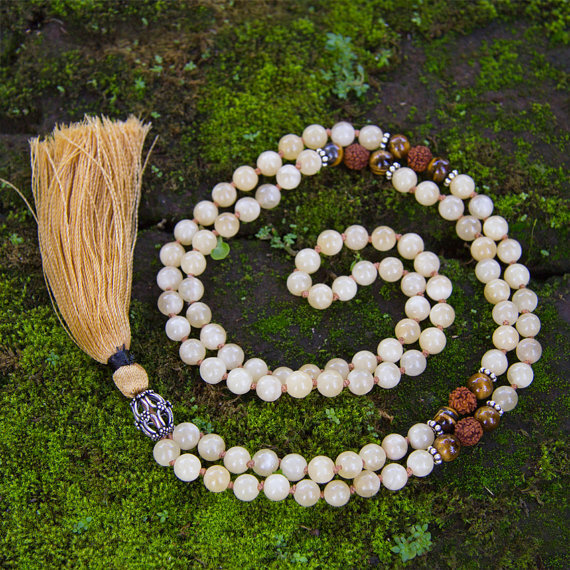 This gorgeous Mala will be your personal good-luck talisman as Tiger Eye is also specifically known as a protecter and bringer of good luck to the wearer. It has the power to focus the mind, promotes mental clarity and balances yin-yang energizing the emotional body. Tiger Eye also stabilises mood swings, strengthens willpower, purpose, courage and self-confidence, and releases tension. The addition of 4 Rudraksha beads makes it a real self power Mala.